developed their own reliable identification systems, along with documentation giving full traceability back to raw material source. a quality system which fully utilises process flow and control charts meeting customers’ compliance criteria for their continued accreditation to International Quality Standards. a policy of continuous improvements in methods of manufacture and quality control systems. This policy has lead to a successful audit from Lloyds and we now hold ISO9001 - 2015 certification. A copy of the certificate can be viewed by clicking here. Nickel - Chrome steels are notoriously difficult to machine but Kingfisher has developed special techniques after prolonged experimentation. The quality of finish achieved is one of the world's best and Kingfisher's usual high standard has been applied to this range. Stainless Steel Grease Fittings are necessary for the lubrication of bearings in hostile environments and we are sure that our world-wide customers will continue to add to the demand for these exotic fittings. The head is made with an annular groove in the plain portion. On assembly the head is forced into the body and metal is swaged into the groove. 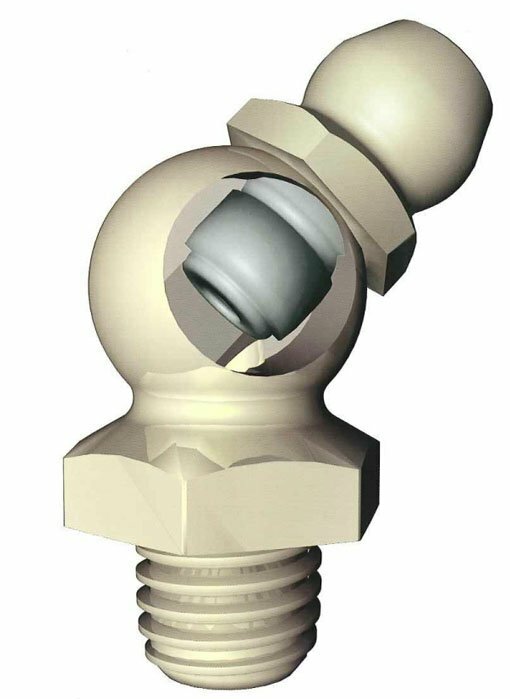 The Kinglok method of construction provides a very substantial mechanical joint with a leak-proof fit.